NORFOLK --- The U.S. Navy's first purpose-built expeditionary sea base, USNS Lewis B. Puller (T-ESB 3), departed from Naval Station Norfolk to begin its first operational deployment, July 10. Puller is deploying to the U.S. 5th Fleet to provide operational support for U.S. Navy and allied forces operating in the region. "We call ourselves 'Team Puller,'" said Cmdr. Arlen Rose, the military detachment's officer in charge. "The Puller is a brand new ship, so we had a lot to learn. The military crew has been training with the ship's civil service mariners for a year to prepare for this deployment." "We are ready to get Puller out there to takes its rightful place in the fleet," added Rose. "Everyone is really excited to get to work and see what the Puller can do." 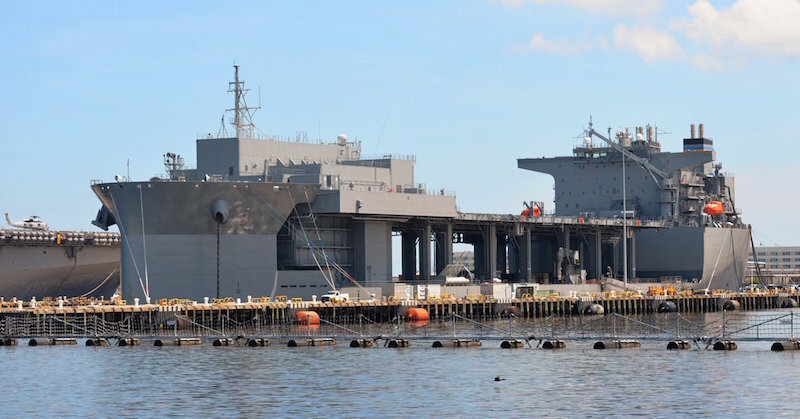 USNS Lewis B. Puller was delivered to the U.S. Navy's Military Sealift Command (MSC) in June 2015 and is the Navy's first purpose-built expeditionary sea base. The ship has a hybrid-manned crew with a combination of military personnel and civilian mariners (CIVMAR). "The CIVMARs aboard Puller primarily focus on the operation of the ship," said Capt. George McCarthy, the Puller's master. "The CIVMARs perform a variety of critical tasks including navigation, propulsion and ventilation services." The 784 foot-long vessel features a 52,000 square-foot flight deck, fuel and equipment storage, repair spaces, magazines, and mission-planning spaces. Able to accommodate up to 250 personnel, USNS Lewis B. Puller will support multiple missions, such as air mine counter measures, counter-piracy operations, maritime security operations, humanitarian aid and disaster relief missions, and crisis response operations. According to McCarthy, the Puller is going to be permanently deployed overseas, which saves a tremendous amount of time in terms of operations. So the ship's maintenance, repairs and crew swaps will take place in theater. USNS Lewis B. Puller is named after Lt. Gen, Lewis Burwell "Chesty" Puller, one of the most decorated members of the Marine Corps. He is one of only two men, and the only Marine, to be awarded five Navy Crosses. He fought in Haiti and Nicaragua, and participated in battles of World War II and the Korean War. Puller retired from the Marine Corps in 1955 and spent the remainder of his life in Virginia. USNS Lewis B. Puller is the expeditionary sea base-variant of the expeditionary transfer dock (ESD) which includes USNS Montford Point (T-ESD 1) and USNS John Glenn (T-ESD 2). The second expeditionary sea base, USNS Hershel "Woody" Williams (T-ESB 4), is currently under construction by General Dynamics National Steel and Shipbuilding Company (NASSCO) in San Diego. MSC operates approximately 120 non-combatant, civilian-crewed ships that replenish U.S. Navy ships, conduct specialized missions, and strategically preposition combat cargo at sea around the world, while moving military cargo and supplies used by deployed U.S. forces and coalition partners.